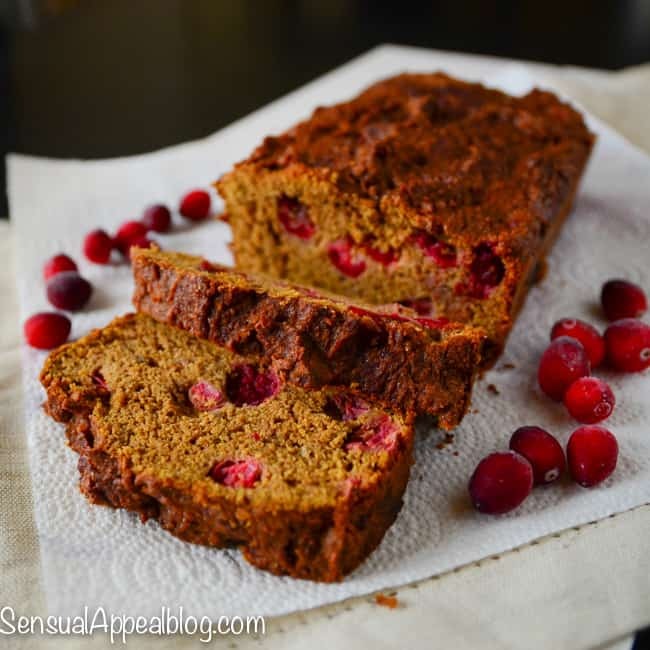 This fantastic Cranberry Pumpkin Bread was created as a Halloween recipe for a sponsored post for Mariano’s via Collective Bias®. I’ve been itching to check out the new Mariano’s store in Chicago’s Greektown neighborhood ever since they opened a couple of months ago. We have one in the suburbs and I’ve been to it and my parents absolutely love it! Needless to say I was excited to finally get on the bus and make a trip over there and get some ingredients to make a yummy Halloween recipe. I had no idea what to make for the Halloween recipe. I was trying to think of some uber creative Halloween party ideas but then I thought that all of the ideas I was coming up with were not as creative as I thought. They were overplayed. We’ve all seen the creepy fingers and eyeballs and whatnot. I decided to opt for a something that hits closer to home. I bought cranberries and pumpkin at Mariano’s and got to baking! 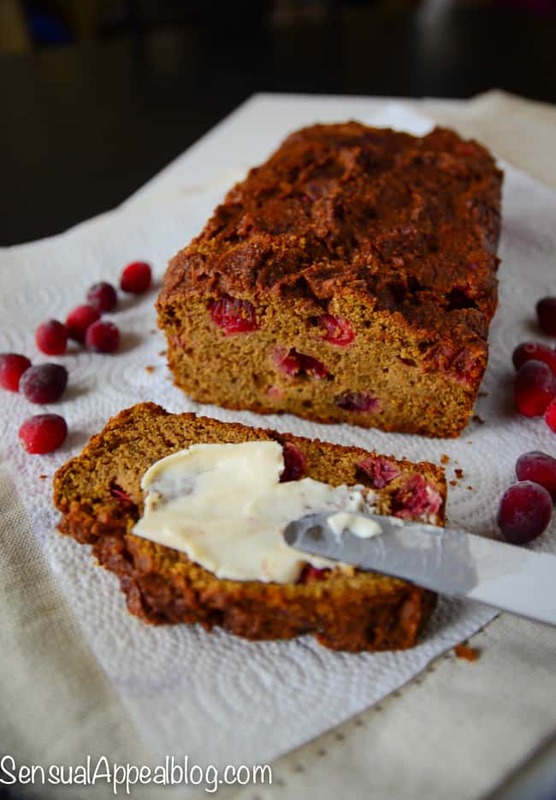 My Halloween party idea is to keep it homey so the Halloween recipe is a HEALTHY Cranberry Pumpkin Bread. All of the recipes are more likely to be pretty unhealthy around Halloween time. No surprise here, the holiday is filled with candy, chocolate, and more sweets. Why not keep the delicious Autumn flavors and create a better-for-you snack that you can easily bring to a Halloween party and be sure that it will be eaten right up! The outcome of this Cranberry Pumpkin Bread was just phenomenal. Oh my goodness.. The bread is just slightly sweet, a bit dense, and the tartness from the cranberries is felt deliciously as a beautiful add of burst of flavor. The whole bread has a nice complexity that is hard to beat. Needless to say – this bread most definitely does NOT taste healthy! It tastes like Autumn should. It’s comforting. It’s dense. It’s a bit moist. It’s just perfect. I loved slathering a pat of cream cheese and jam on top as you could see in my recent Instagram photo. I think it’s a perfect Halloween recipe even if it’s not necessarily one of the “creepy” or “scary-looking” ones. It’s creative nonetheless. Check out Mariano’s recent Opera Flash Mob video. Mariano’s is now definitely one of my favorite stores. They’ve got all the healthy and organic products, they’ve got specialty and cultural products (saw some Polish brands there too! Yay), they’ve got the regular grocery store products… the whole experience was really pleasant. I already like grocery shopping because I’m a weirdo but I certainly like some stores more than others. 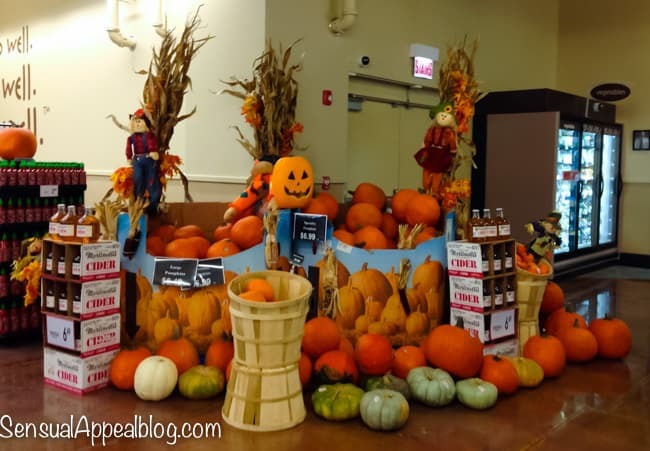 Mariano’s was much more than a mere shopping trip, it was an experience. The Halloween specialty products were scattered nicely all around the store and they had wonderful sections of fresh veggies and fruit, a nice and big deli department, and I loved their nut & seed section. Mariano’s is like a Whole Foods but without the pretentiousness and ultra high prices. And I love that they have a reward card. Have you ever made a scary/creepy Halloween recipe? What was it? Do you like those creepy creative Halloween recipes or do you prefer to stick to more comforting and traditional recipes for Halloween? You can never have too many pumpkin bread recipes. That’s my story and I’m sticking to it. Wauw, so many pumpkins! I need to move to America… Preferably somewhere close to you I think 😛 This recipe looks a lot healthier than most of the ‘creative’ recipes out there! I think it looks tastier too..
Haha yes! Thank you dear! Yeah I definitely didn’t realize pumpkin was such a craze until I moved to the US a couple years back. It’s intense over here! Pumpkin and cranberries are such a great combination. Yum! IF IF IF I could master this and slice it I could serve it for my BOOK CLUB next week!!! Pumpkin and cranberries, great combination! Kammie, your bread looks incredible! I want a slice to go with my morning coffee!! What a healthy, festive bread, Kammie! I love the combination of flavors. Since I have kids, I do prefer to make CUTE (not creepy) Halloween treats for them but more comforting recipes for me and my husband. Your bread looks incredible, and I love that it’s healthy, too! I’ve made pumpkin cranberry bread before from a recipe in one of my favorite cookbooks, and it’s such a great combination of tart and sweet! Yes! It was my first time using cranberries in baking and I absolutely loved the burst of tartness. Great combo indeed. Goood! Don’t give up! Pumpkin season is fab! But seriously, this bread will make you fall in love with pumpkin all over again. Your bread looks amazing! Those cranberries are gorgeous! Love that you added some protein powder. Wish we had a Mariano’s near us. Oh wow this looks good! :) I need this in my life, lol!! I love pumpkin bread in the fall and never buy cranberries, but sure do love the tart flavor they give quickbreads and muffins! :) Thanks for the recipe!! Why have I not thought to do cranberry and pumpkin together? It’s such a DUH moment for me right now. This looks SO incredible! I love the combination of pumpkin and cranberries! Yum! I like a mix of both for my Halloween recipes, the comforting ones are best – but sometimes it’s fun to throw in a cute/spooky one! Yum, this combines my two faves about the fall!! Num num num! and the photos so pretty! This bread looks delicious! So moist! I am dying to get my hands on some fresh cranberries but haven’t been able to find them yet around here … hopefully soon! 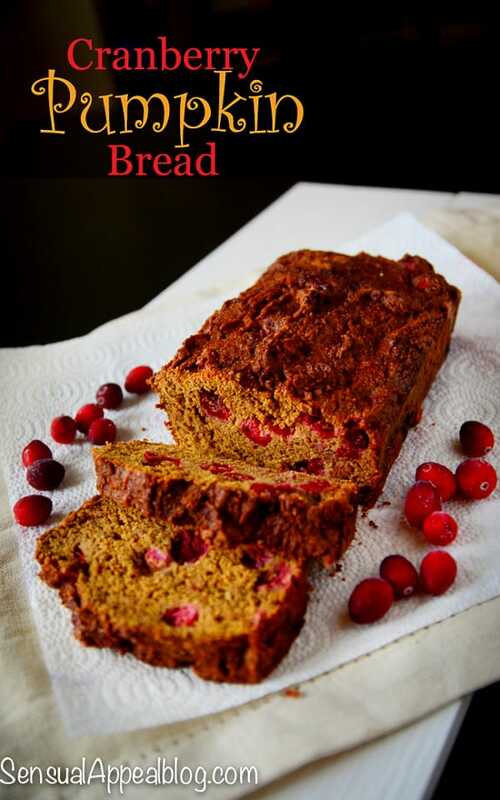 This bread looks delicious, I love the idea of adding that beautiful cranberry color in it! Absolutely delicious! I loooove pumpkin and cranberry together!! This looks delicious Kammie! 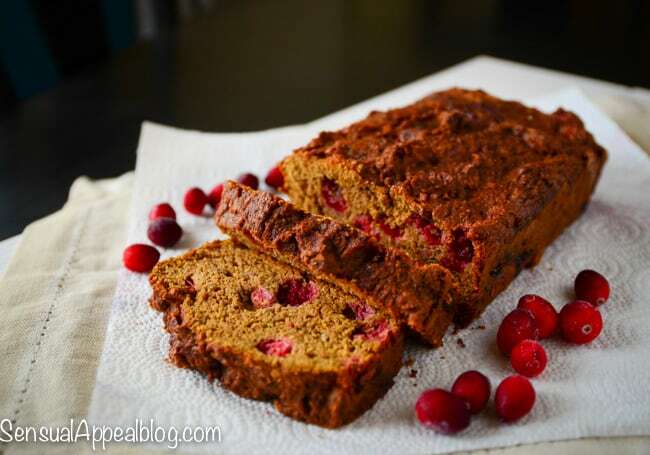 Your cranberry pumpkin bread looks so amazing, Kammie! Absolutely brimming with the flavors of autumn. I’m sure I could easily make this vegan by replacing the eggs with flax, or maybe even more pumpkin! I’ll have to give it a try! What a yummy looking bread! Pumpkin and cranberry is such a lovely combo. Thanks for sharing. This looks delicious! Fall is associated with bread baking for me. My mom used to make pumpkin bread every year with ridiculously good cream cheese spread. I knew I wasn’t the only one about eating pumpkin bread with a cream cheese! Mmm that sounds great. What kind of a spread was it, do you know? I think it was just cream cheese with vanilla and a lot of sugar whipped in! Omg this recipe just made me realize how excited I am for cranberry season! Although it’s technically in season, I haven’t spotted them anywhere yet. Soon, though!! Yay! I do admit, I didn’t find the cranberries right away but I was very happy when I did! This looks really good! I think I’ll always be finding something great here on your blog. I’m a new follower via Google+ and bloglovin. Hope you’ll stop by my blog and check it out (and maybe join us at Meet & Greet). I’m looking forward to more of your posts.